Happy Friday beauties!! Thank you for the kind thoughts on yesterday's post. I know my friend will love to hear them!!! Today I'm just going to give you some Friday letters and, hopefully, a few laughs. Dear Brian: I'm so glad you took half of your test today to get your pilots license. I hope the weather works in your favor next week so you can finish!! I'm kind of excited for this also because I wont have billions of papers and notebooks all over the place. Organization is the best policy! Dear weather: I really dislike you. Yesterday was beautiful and today is also. But the wind and cold, my goodness. I'd love to take the dog for a walk but he'll probably get swept away by how strong the wind is. Dear Abnormal Psych Professor: why does it seem that I'm writing a letter to you every week. Lets be real here, school is done but that doesnt mean you can just not respond. No wonder the head of the department doesnt like you. I spent two hours doing our last test on Sunday night. I sent it in a few hours before it was due. I'd really love to know my grade. Dear Bailey: I hate the fact that you have a collapsing tracheal. It makes me sad when you cough or choke on treats even when they are broken up like last night. You're very stubborn though when it comes to drinking water to help fix the problem. Luckily we tricked you into drinking which worked. Bottom line, chew your food please! Dear Comcast: Thank you for coming to give us a new router. I wasnt too thrilled about paying an extra $30 a month for internet on my phone when it wouldnt even connect. Dear Insurance people: While I feel blessed that we have you, I'm not to thrilled at how stubborn you are being. I appreciate that you cover the cost of all my medical bills and that you sent me a refund check for some odd reason but my parents are paying you to cover their medical bills to and you havent paid any of them. I'm pretty sure it shouldnt take 4 tries for you to receive papers via fax machine. Lets get on this and fix it, k? Thanks! Dear Pinterest: How dare you get me sucked in. This is why I didnt go on you during school. Now if I could just jump on the bandwagon and do a project from you! Dear little boy on Ellen: You are seriously the cutest!! children are just so innocent and pure. Pinterest is way addicting! Have a great weekend! Pinterest is my biggest downfall, I can spend mindless hours on there but have yet to complete any projects, unless of course you count recipes. I hate when teachers take forever to give back your grade!! So freaking annoying! 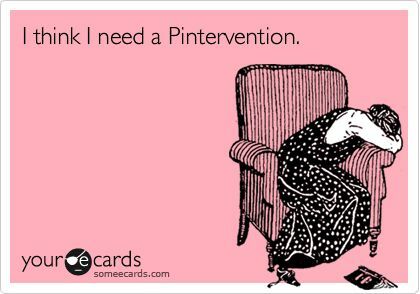 I am addicted to Pinterest! I love it way too much..
Yay to your hunny finishing part of his test!